The bike will be up for auction for charity soon and kits will be up for sale from July 22. The proceeds of which would go towards 'YouWeCan' cancer awareness campaigns. 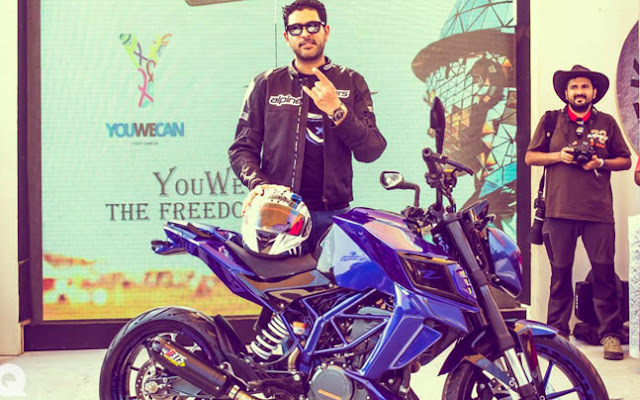 Star cricketer and auto enthusiast Yuvraj Singh along with Mukul Nanda, Founder Director of Autologue Design, launched the company's flagship custom-built kit KTM X-26 and the Yuvraj Special X-12 on KTM Duke 390. Yuvraj Singh said, "My first big bike was custom made into a street fighter by Autologue. I just loved their capabilities to design and build custom kits, and was sure that the 'YouWeCan' bike had to be built by Autologue. The idea of a custom kit really appealed to me as it would remain a unique style statement despite several people adding it on their bikes." Mukul Nanda said, "By offering X26 and the X12 kits Autologue Design has demonstrated the potential of customizing a KTM duke 200/390 bike into a unique street fighter. This can be extended to bikes other than KTM." Yuvraj said, "I love the way the 'YouWeCan' bike has turned out and have plans to be more actively involved with Autologue in future." Mukul added, "The Limited edition KTM kit contains a Tank Cover, Headlight, Radiator Cover, Belly Cover, Side Panels, Tail Tidy and Tyre Hugger at a very competitive price of Rs 49,390. The rear seat cowl and anodized CNC machined bits are optional."